Leinster captain happy to leave France with four points after a testing afternoon. 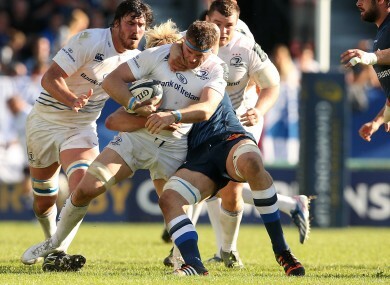 Heaslip: led Leinster with 19 carries. JAMIE HEASLIP PRAISED the spirit Leinster showed in grinding out a narrow win against Castres Olympique. Ian Madigan kicked all the points as the visitors rallied from seven down in the final quarter to win 21-16. The win takes Leinster to the top of Pool 2 for now at least. Wasps host Harlequins later this evening (5.15 pm, BT Sport). Matt O’Connor’s side did things the hard way and found themselves 7-0 down when Saimone Taumoepeau was driven over for the game’s only try after just six minutes. Captain Heaslip told Sky Sports: “I thought we got momentum at times and broke them down but mistakes kind of killed us. “We turned over the ball quite easily to them. We didn’t help ourselves in that first 15 minutes. We compounded a lot of errors to let them back into the game and get some easy penalties. [There was] a lot of grit there and that’s a very happy changing room. It’s a tired changing room but it just shows that when we need to go to that place of really pushing it and grinding it out, we can do it. Heaslip, who led his side with 19 carries, said there will be plenty of room to improve when the competition resumes with a trip to Harlequins on 7 December. “The good side of that is that we’ll get a lot of work-ons but we’re happy, two wins from two in the first two rounds. Email “Heaslip: Mistakes killed us - but we proved we're able to grind out the win”. Feedback on “Heaslip: Mistakes killed us - but we proved we're able to grind out the win”.